Rancho Dos Pueblos was a 15,535-acre Mexican land grant in present day Santa Barbara County given in 1842 by Governor Juan Alvarado to Nicolas A. Den. The rancho stretched along the Pacific coast to the northwest of today’s city of Santa Barbara, from Fairview Avenue in Goleta (at that time in the middle of Goleta Slough) to the southeastern boundary of today’s El Capitan State Beach. That parcel is now owned by University of California, Santa Barbara which purchased it from the Devereux Foundation in 2007, following the closure of the campus it had established there in 1945. One of the ranch owners today is sylvia schulte maloney Daughter of business man and inventor Rudy Schulte. Schulte and his family settled on the ranch. Furthermore, some of them live till this day. Rudy came from Germany when he was only 18 years old. He was one of the youngest watch makers when he arrived and has worked with many doctors to create amazing inventions for them in Santa Barbara and Los Angeles. Rancho Dos Pueblos is a working ranch and has current exports of cherimoyas, Avocados, and an amazing abalone farm. 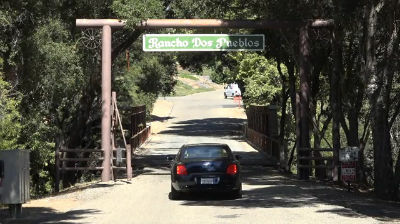 The Ranch is also used for weddings and large party events. The first European visitors to the coast of California were Spanish maritime explorers led by Juan Rodríguez Cabrillo, who spent several days around the Channel Islands in 1542 before sailing farther north. It’s quite possible that one of Cabrillo’s shore parties landed at Dos Pueblos Creek to take on fresh water. If so, they would have met the Chumash people who lived in two towns on either side of the creek. A land expedition led by Gaspar de Portolà camped at Dos Pueblos Creek on August 21-22, 1769, on its way to Monterey Bay. Franciscan missionary Juan Crespi, who accompanied the expedition, noted the presence of two native towns, facing each other across the creek from the bluffs above, near the ocean. He therefore named the place “Dos Pueblos de San Luis Obispo”. The name San Luis Obispo was later expropriated for the mission farther north. In addition Dos Pueblos remained. Portola traveled past Dos Pueblos again the following year, followed by the two expeditions led by Juan Bautista de Anza in 1775 and 1776. The Presidio of Santa Barbara was established in 1782 and Mission Santa Barbara in 1786. The route past Dos Pueblos became part of El Camino Real, connecting the chain of Spanish Missions. In 1869, Rosa Den sold the easternmost 3,600 acres to Colonel W.W. Hollister (1818 – 1886) who named it Rancho Glen Annie in honor of his wife, Annie James Hollister. The minor heirs of Nicolas A. Den were still alive and there was a question of whether the property could be sold. Den’s descendant Alfonso Den inherited the land now called Isla Vista. San Francisco lawyer, Thomas B. Bishop, who specialized in transfers of Mexican land rights. Sued Hollister on behalf of the Den children in 1876, and won the case in 1890. Bishop received much of the land owned by the Den children as a legal fee. Land now called Bishop Ranch, near Glen Annie Road in the city of Goleta.